Cold winter months call for big pots of simmering, stick-to-your-ribs comfort food! 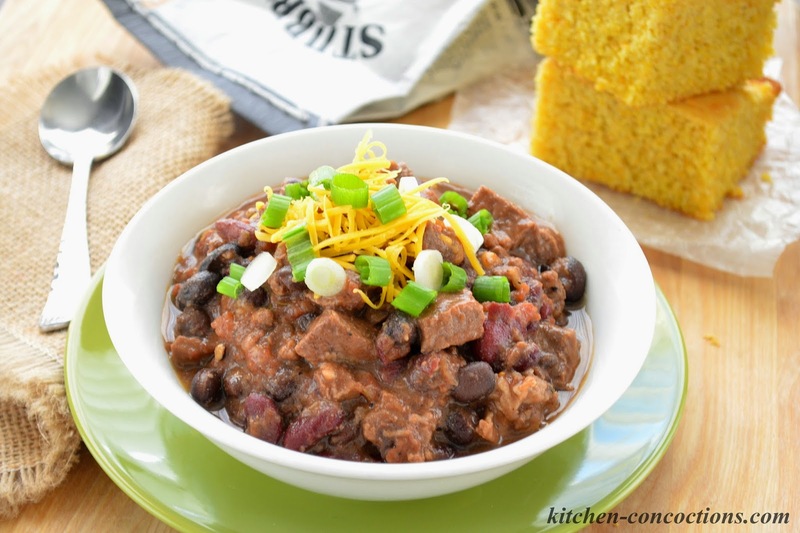 Personally, I love to warm up with a big hearty bowl of spicy chili (with homemade cornbread, of course!) Today I am partnering with Stubb’s Sauces and Marinades to share my current favorite chili recipe plus my tips to really amp up your chili! Chili is deeply personal and rich in not only flavor but deep rooted memories and customs. It seems like every home cook and professional chef is a chili expert and has an award winning recipe or secret chili tip. Because of this, chili connoisseurs all over the world have endless debates over what makes an authentic pot of chili. 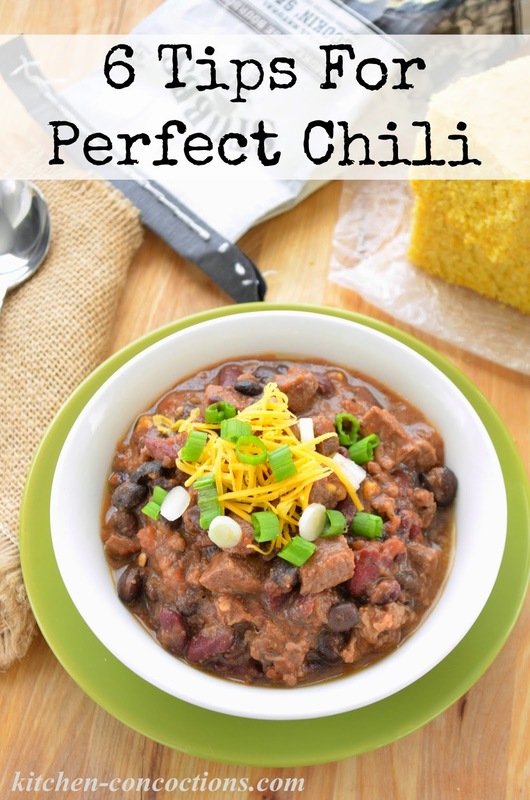 But chili is a fantastic dish that can be customized in a variety of ways! The meat: Ground beef is the most common type of chili meat; however, to change it up, consider using bacon, sausage, leftover shredded turkey or chicken, tofu or other types of ground meat like lamb or bison. Since the best chili comes from slow cooking over low heat; lean or tougher cuts of meat, like chuck roast, beef short ribs, elk or venison, do well with this cooking method. The beans: Some chili traditionalist strongly believe that chili should be hearty yet simple with just meat and spices. But for many others, beans are a key ingredient to a perfect bowl of chili. 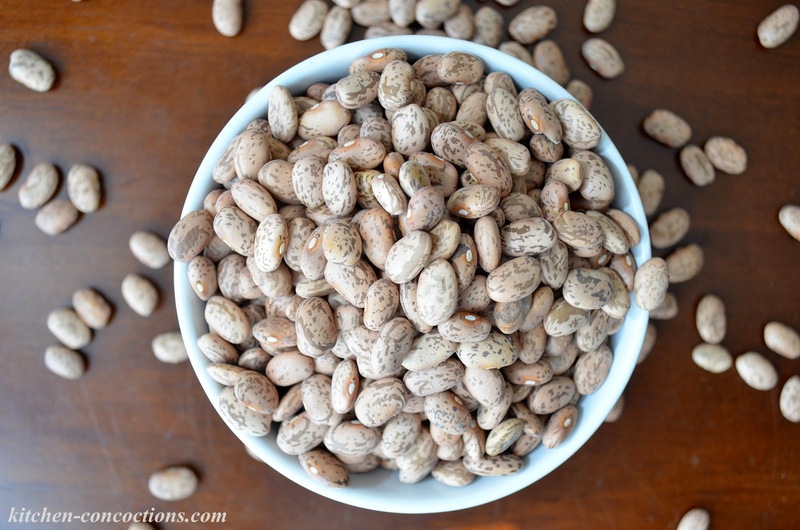 Since chili is cooked for a long period of time, dried beans are an affordable option. Simply precook dried beans or include enough cooking liquid to cook the dried beans appropriately in the pot. Canned beans are more convenient, but can often have added flavors or sodium. To yield the best chili, use quality brands and choose canned beans with no added flavors and are labeled low sodium or salt free. Just as with the type of meat, change up your chili by using kidney beans, pinto beans, black beans, cannellini beans, or great northern beans. The spices: No matter how you like your chili, the variety of spices are crucial to a mouthwatering chili. Most chili connoisseurs firmly believe in purchasing dried chilies and grinding them yourself. However, if you have a well stocked spice cabinet, you can concoct a special chili seasoning blend all of your own. Chili powder, cayenne powder, red chili flakes, cumin, dried oregano, smoked paprika, and even Stubb’s Bar-B-Q Spice Rub can all add nice flavor profiles. The cooking liquid: Due to the long cooking process, proper cooking liquid is essential to preparing chili. While beef or chicken broth is common, beer, coffee, bloody mary mix, cola and red wine can all be added. Secret ingredients: Many chili enthusiast have special, secret, ingredients they add to make their pot of chili over the top. Unsweetened baking chocolate or cocoa powder, cinnamon, pumpkin puree, peanut butter, liquid smoke, soy sauce, Bar-B-Q sauce or even Stubb’s Smokehouse Bourbon Cooking Sauce can all be found in many “award winning” chili recipes. Toppings and sides: Just like what goes into a custom pot of chili, the toppings and what is served along side the perfect bowl can be personal and vary from region to region. Most popular chili toppings include cheddar cheese, onions, sour cream or fresh cilantro. To change it up, try using different varieties of cheese, nuts, pumpkin seeds, fresh or pickled jalapenos or guacamole. Corn chips and corn bread are more common sides to pair with chili, but some enjoy serving chili with rice, baked potatoes, mashed potatoes, tortillas or even spaghetti! 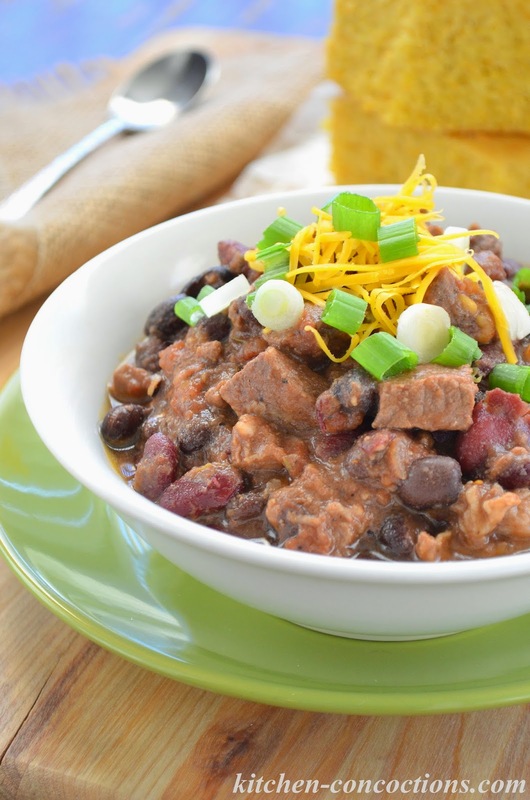 This Bourbon Beef and Bean Chili is a tasty twist on traditional chili. It is loaded with two different cuts of meat, two different varieties of beans, and has a spicy, yet tangy sauce! 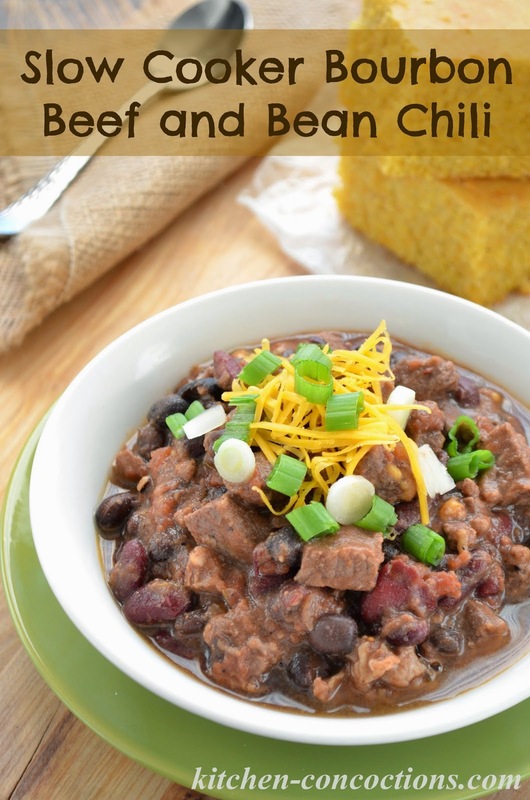 A spicy and tangy chili packed with two different varieties of beef and beans, all cooked in the slow cooker. Heat a large saute pan over high heat. Add ground sirloin and half of the Stubb’s Smokehouse Bourbon Spice Pack to pan. Cook, breaking up meat with a wooden spoon, until meat is cooked through and no longer pink, about 5-6 minutes. Add cooked beef to slow cooker. Toss remaining Stubb’s Smokehouse Bourbon Spice Pack with diced chuck roast. Add seasoned chuck roast to slow cooker. To slow cooker add Stubb’s Smokehouse Bourbon Cooking Sauce, beef broth, onions, garlic, tomatoes, beans, dried herbs and spices. Stir to combine. Cover and cook on high for 4-5 hours or low for 8-9 hours. Right before serving, adjust seasonings to taste, if needed. Serve topped with preferred chili toppings, such as sliced green onions, cheese, sour cream or even candied pecans, if desired.